-- Select a Size/Color -- X-Large - Out of Stock! 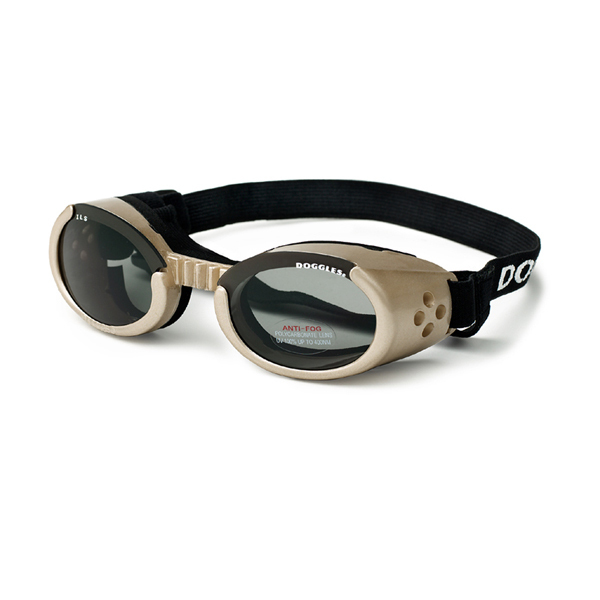 Our ILS Dog Goggles in Chrome are designed to protect dog's eyes from the sun's harmful rays, flying debris, wind, rocks, or bugs. Your dog can't tell you his eyes hurt, so be proactive and help your dog help his or her own eyes. The polycarbonate lenses are shatterproof and anti-fog. 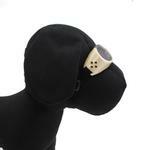 Should your dog manage to scratch a lens, they are easily replaced with the ILS model. The lenses can be traded out for other colors (sold separately) or even clear lenses for dogs requiring indoor eye protection. Doggles also come recommended by Vet Ophthalmologists to protect their patients in all types of situations and also after some types of eye surgery. And don't forget that these Chrome* Frame and Smoke Color Lens Doggles are in the height of dog fashion! *Chrome in color - not made of chrome. Doggles - ILS Chrome Frame with Smoke Lens Customer Photos - Send us your photo! Walter is considered not only a member of our family but also in the entire community. He has his own bed on the NAPA Auto Parts Sore in Sheridan Montana and retrieves pens and money from the customers. My pet is so smart....He has a cataract in one eye..So I bought the goggles so the other eye will not go bad. He is really friendly loves people. She's a rescue and loves to jump through the bushes. So she doesn't hurt her eyes, I got her these awesome goggles for protection. Hudson is a smart, cute and loving boy cavapoo. He wears his goggles every time we go for a car ride. Chudleigh loves his daily walks...especially when Mommy protects his feet from the hot pavements and his eyes fro the glaring sun....he loves taking one of his "babies" with him and when people smile and tell us he "made their day" makes our day! Pearl and I got a new ride, it's a vintage style scooter with a sidecar. Pearl loves it and is styling in her matching doggles. Cosmo is a Poochon with an eye that doesn't blink so these are more than just fashionable, though he DOES look very cool in them. Bella lookin super cute in her doggles! These are my boys sportin their doggles when we first got them! So cute! Nutmeg likes to keep her cool! Dog goes protect her eyes. Monk is a rescue from Maxfund in Denver. He is an energetic little rascal who keeps us smiling all day. After playing with his toys, he loves to snuggle up and be loved on for as long as possible. Monk loves to be outside and wears his Doggles to give him some panache. Delilah loves her Doggles when she's watching for her Daddy to come home on a sunny day. Grover is from the pound , and was there over 21 days! He loves children and seems to be so calm. He will sit as still as a mouse in your lap.i decided to see if he would be calm on top of the bike one day and the rest is all easy to see! Bubba is almost 2 and has a brother and sister (both boxers too). He is the craziest boxer we have lived with, and he is our forth one! Bubba LOVES people and playing with his big brother Boone! Chicks dig him in his doggles (which he wears while riding in the golf cart), Peace! This is Penelope wearing her doggles. She has a wardrobe of colors and always gets rave notices when she wears them. She feels very glamorous in her beautiful doggles. Kooper is 8 months old. More energy than the energizer bunny. Loves car rides and people. Charlie, a girl with a boy's name loves a convertible ride, dancing a Figure 8 with Mom, and her walks. Her page advocates responsible pet ownership. I adopted this 9-y/o cutie from TAPS, a no-kill shelter in Pekin, IL, about 2 months ago. Unknown to me, she had a congenital eye disease, progressive retinal atrophy, which will eventually end in blindness. Her pupils are constantly dilated causing her to squint in bright light, so I bought the Doggles to help alleviate the constant squinting and hopefully slow the progress of her disease. She loves to walk and she knows when the Doggles go on, it's time to go. Sully says, "There's nothing like a nice breezy day to sport my doggles and pose like a pro model." Sadie just loves her doggles! She hangs out the window and makes all the other motorists smile. She has gotten many thumbs up and is asked all the time where we bought them. We reply baxterboo.com! Jack is an outgoing boy who loves to be outdoors or cruising in the car. Jack loves to wear his shades not only for protection, but for the cool factor. Joe Cool has nothing on Jack. Check out these cool shades on Murdock! Rebel needed some protection for his little blue eyes. He will HAVE to be Iceman when Halloween comes around! He loves to sun himself in our kitchen, but is about half blind. We used Doggles to help preserve his remaining eyesight a little longer. Imani goes on a lot of outdoor events when the weather is nice..this was her trying her google on for the 1st time..while laying her chin on a few other items ordered on here. Battman is 5 years old and he loves his Doggles from BaxterBoo. 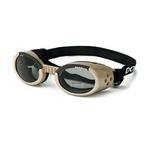 Battman has sensitive beautiful green eyes and these Doggles are perfect for protecting them. Smitty, my adopted Bichon....geared for a bike ride. Katis Sue is a 6 yr old AKC Shih tzu. She loves to be outside but hates the sun. These Doggles are perfect for her. With her Visor and Shades she is ready for Summer and Hollywood if anyones interested!! Snowplow likes to be included in everything and is a bundle of love to everyone. He is a an important member of our family and certified therapy dog. Coz (Cosmo) is 9 years old. He loves all people and other dogs. He enjoys riding in the convertible, on the motorcycle and going on walks. Coz also loves his clothes, whether it be a hoodie or a t-shirt, he dresses to impress! Sophie looks so cool in her Doggles!! Elvis sporting his Doggles while cruisin' around town! Tobey loved his doggles the first time he put them on. Protecting his eyes is very important, the doggles fit the bill. Tobey loved his Doggles the first time he had them on him. Protecting his eyes is very important, the doggles fit the bill. Dakota thinks he's a movie star! I recently watched our local news cast about a man and his dog wearing "doggles". Since Dakota loves sticking his head out of the car 99% of the time I thought that I would get him a pair to protect his eyes. They arrived last week and Dakota LOVES them. I think he thinks he's a movie star! Just got my Doggles & I'm heading out for a ride. Clancy trying on his brand-new Doggles! Stella is sweet,playfull. She likes cars! She is very sweet,smart,and playfull. He really does have eyes under all that fur that need to be protected. Isaac loves to go cruzzin' in my 1972 TR-6 with the top down. The Doggles keeps his hair and other stuff out of his eyes. Plus he looks real cool. Bailey is my Toy Poodle, he goes everywhere with us!! He is friendly and sweet!!! Issie Just Loves The Goggles, Shirt And Collar.. She Is A Baxter Boo Dog..
Couldn't wait to wear them - not even to take off the stickers! Little Demi, a 5 lb. toy schnauzer is singing with the Steel Drum Band poolside, while sporting her doogles that she got from BaxterBoo. She was the hit of the vacation all the while protecting her sensitive little hazel green eyes. Nose to the wind my brothers! So anxious to try out the new Doggles ... we forgot to take off the stickers! Simon enjoying a beautiful spring day in his new Doggles and hoodie! Biker Diva, Kippy, ready to ride! This is Precious with her original pair of Doggles on. People always stop to take her picture and they can't believe she keeps them on without trying to take them off. Keezle spends a day cheering at the crew races! Please check out my video "Cool black lab wearing Doggles sunglasses **HD**" on YouTube.com! Sully rockin his new doggles. Hey, I'm a cool dog in my Doggles! These are Chevy's new "Doggles" and they really help with the sunlight in his eyes. His vet said they were perfect for his eyes and had great protection from the sun! We love them. I'm delighted with my new Doggles goggles! Taking a walk to the park with my new shades. Great Dane 10 months old. Great Danes ( Bella and Blue ) cruising Atlanta checking out the sights through his BaxterBoo doggles !!! While stylein' around town, we were photographed multiple times by fans. Thank you BaxterBoo!!!!! Tug sport'n his new Doggles. Chopper is ready to ride in his new Doggles! Dozer in his Doggles...ready for his walk! MOH LOVES HIS DOGGLES such a great buy! Trooper loves his new shades! Yeah mom I look cool....now lets go!!!! Jaeger going for a stroll in his Doggles and biker harness. Lookin Cool after her motorcycle ride....Lola loves her Doggles! Posted On 01/17/19 by Susie A from , Yes, Susie A recommends this product! These Doogles are great! Our Great Dane insists on hanging his big head out of the truck window, even in the winter. I definitely have peace of mind knowing his eyesare protected. I love these, the dogs not so much but working on it. They fit the face pretty good. Posted On 10/20/17 by Frances K from , NJ Yes, Frances K recommends this product! The glasses themselve s are fine. However, am disappointed in the color. I have an older regular chrome Doggles glasses and the color is more like a gold. The ILS color is more like a cream. Not what I was expecting as I thought they would be the same color as my old chrome ones. Even the picture looks more like a gold to me. This, of course, has nothing to do with Baxter Boo which is a great company. Posted On 08/15/17 by Gigi L from Parrish, FL Yes, Gigi L recommends this product! Perfect for the Florida Sun! Love the way the 2 strap system keeps glasses in place and secure. Sensible and very fashionable! Posted On 05/01/17 by Yvonne J H from Phoenix, AZ Yes, Yvonne J H recommends this product! These are just the cutest things ever !!!!! Light and fit dog well. I am getting him use to them by making him wear for 30 minutes twice a day .I think he will wear them now cuz today he fell asleep with them on . Posted On 03/14/17 by Shannon D from , TX Yes, Shannon D recommends this product! Posted On 12/08/16 by Lynne D from Pittsburgh, PA Yes, Lynne D recommends this product! The doogles are great. I bought them because my dog keeps scratching his eyes and is in jeopardy of losing his one eye. I thought it would be better than keeping him in a cone all day. The doogles work but my dog is still trying to adjust. If he does not start cooperating I may have to buy him a space helmet. Posted On 11/29/16 by Rhonda W from Yuma, AZ Yes, Rhonda W recommends this product! Posted On 04/23/16 by Paige K from Grosse Ile, MI Yes, Paige K recommends this product! They fit well to my Dog's head. They look great on him. We use them when the top is down on the convertible. Posted On 10/26/15 by Steff G from Portland, OR Yes, Steff G recommends this product! LOVE these Doggles!! They fit great and work awesome for my little Chihuahua Duke!!! Posted On 05/27/15 by Carol P from Easley, SC Yes, Carol P recommends this product! Thanks Baxter Boo. Scion will love his Doggles when we make our trip to the beach this summer. We are putting them on him a little each day so he can get use to them. Thank You we love them. Posted On 03/08/15 by Gary P from DEATSVILLE, AL Yes, Gary P recommends this product! Dog likes them now he rides the motorcycle everywhere. Posted On 12/25/14 by Marie R from Waunakee, WI Yes, Marie R recommends this product! Posted On 10/11/14 by Sandra R from Cottrellville, MI Yes, Sandra R recommends this product! They are great! The dogs love wearing them. Posted On 10/09/14 by D. Duncan from , CA Yes, D. Duncan recommends this product! Purchased 2 pair, they are easy to adjust & our pup seems comfortable in them. Posted On 10/09/14 by Deb H from Lafayette, CO Yes, Deb H recommends this product! I ordered these for both my dogs to protect their eyes. They fit really well, but it's going to take the dogs a little while to get used to them. They keep pawing them off their faces. I'll just keep working with them until they get used to them, but I think it's great that we can now protect our dogs' eyes from the Colorado sun! Posted On 11/10/13 by Ruth C from Foster City, CA Yes, Ruth C recommends this product! I bought two pairs of these Doggles,,,the red, and then the beige...because they are such a hit with outfits, especially in costume competitions, PLUS protecting my little Chi-Terrier's eyes from winds at her doggy park (next to the Bay). They're comfortable for her to wear and easily loosened or tightened. Depends on your dog, but have seen them on all sizes and many breeds of dogs.